... 1957, Strom Thurmond, the former South Carolina governor who'd been sworn in as a U.S. Senator earlier in the year, ended his marathon effort to keep the Senate from voting on a civil rights bill already overwhelmingly approved by the House of Representatives. Thurmond had talked "for a brain-numbing 24 hours and 18 minutes," as The New York Times described what remains the longest filibuster in history. 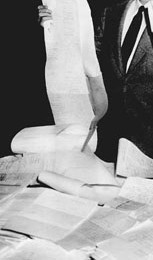 (credit for detail from photo of Thurmond holding streams of paper read during filibuster) This one did not succeed: the Senate approved the bill by a vote of 60 to 15, and President Dwight D. Eisenhower signed the Civil Rights Act of 1957 into law on September 9.